St Kilda is an inner suburb (neighbourhood) of the metropolitan area of Melbourne, Victoria, Australia, 6 km south-east of Melbourne's Central Business District. Step off the beaten path and head to Cheap AZ Travel and Jewish Holocaust Centre. 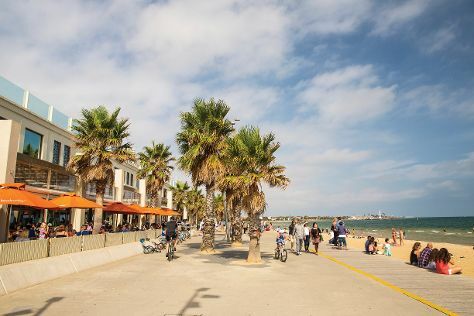 Visit St. Kilda Beach and Brighton Beach for some beach relaxation. Get out of town with these interesting St Kilda side-trips: Werribee (Werribee Open Range Zoo, B-24 Liberator Memorial Restoration Australia, & more), Wilson Botanic Park (in Berwick) and Lysterfield Park (in Narre Warren). The adventure continues: see the interesting displays at Scienceworks, explore the striking landscape at Ngargee Tree, take in the architecture and atmosphere at Williamstown Uniting Church, and stroll the grounds of Historic St Andrew's Anglican Church. For traveler tips, more things to do, photos, and tourist information, refer to the St Kilda journey tool . Singapore, Singapore to St Kilda is an approximately 11-hour flight. You can also do a combination of flight and shuttle. The time zone difference moving from Singapore Time (SGT) to Australian Eastern Standard Time (Victoria) (AEST) is 2 hours. Expect cooler temperatures when traveling from Singapore in May; daily highs in St Kilda reach 20°C and lows reach 10°C. On the 20th (Mon), wrap the sightseeing up by early afternoon so you can travel back home.